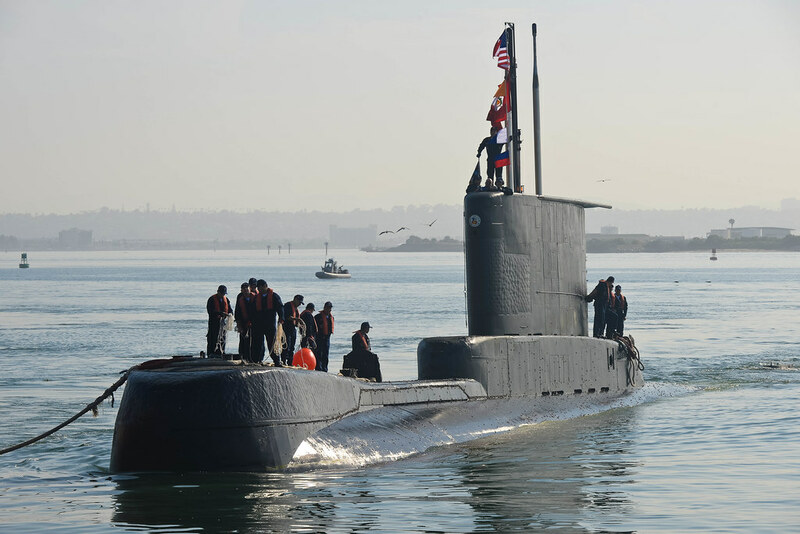 SAN DIEGO - Commander, Helicopter Maritime Strike Wing Pacific (CHSMWP) began phase two of the annual Diesel Electric Submarine Initiative exercise (DESI-EX), an international exercise held annually in conjunction with South American naval forces, Sept. 8, 2017. DESI-EX is an undersea warfare exercise that allows MH-60R aircraft from various CHSMWP and Maritime Patrol and Reconnaissance Aircraft (MPRA) commands the ability to practice their anti-submarine warfare (ASW) skills against a skilled, foreign adversary in a variety of challenging environments. The event was organized by HSM Weapons School Pacific (HSMWSP) in coordination with Commander, Submarine Force Atlantic International Programs and Commander, U.S. 3rd Fleet, and is taking place off Southern California. Phase one of the exercise took place July 15 - 20 and involved aircraft and crews from six CHSMWP and three MPRA squadrons that completed 29 sorties over the course of 147 flight hours. Participants trained alongside the Peruvian Navy submarine BAP Pisagua (SS 33), a German Type 209 diesel-electric submarine, to refine their ASW and tactical acumen. "DESI-EX provides a unique training opportunity for US naval aircraft and crews that is otherwise limited by other means," said Lt. Jeffrey Gruetzmacher, the primary planner and ASW Program Manager at HSMWSP. "The ability to train against a 'thinking' opponent that will continuously act and react based on your maneuvers, and do so over the course of several days, provide aircrews the opportunity to implement time-sensitive tactical decisions in a dynamic and complex environment." Cmdr. Jonathan Baron, HSMWSP commanding officer and the officer conducting exercise for DESI-EX, praised the efforts by all participants and emphasized the importance of the event in regards to the US Navy as a whole. "DESI-EX would not be possible without the coordination and cooperation of HSM-35, HSM-37, HSM-41, HSM-49, HSM-71, HSM-79, VP-1, VP-4, and VP-40," said Baron. "Their professionalism and dedication to their craft have allowed DESI-EX to be as successful as it has been over the course of the last 16 years. Furthermore, the cooperation of the Peruvian Navy and past participants underscores the mutual goal to strive for excellence, safety, and security for all nations during global maritime operations." DESI-EX was established in 2001 by the United State Fleet Forces Command. Since, it has afforded ASW-centric squadrons the ability to refine coordination among dissimilar U.S. Navy aircraft and have promoted interoperability with allied nations to complete common missions.